Baby corn also known as Candle Corn is often used in Thai cuisine. When baby corn first hit the Indian produce markets, it was a rage. I remember when Dad used to bring a whole lot of these fresh from the market, and we knew what was for dinner that night. 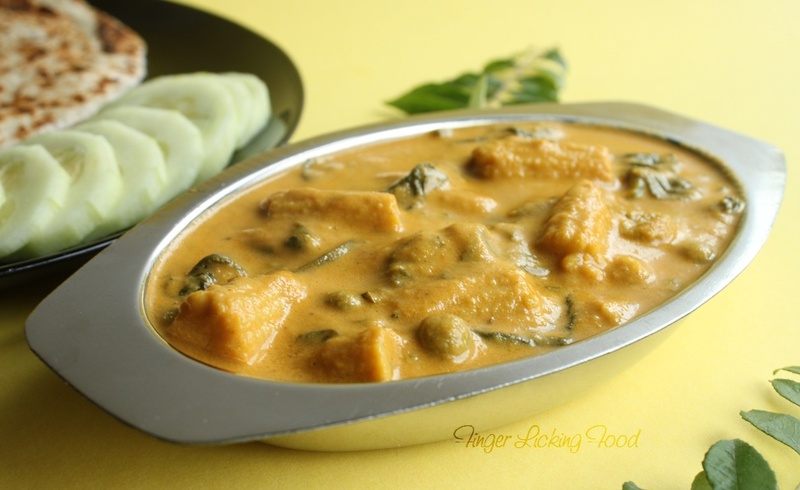 Either baby corn manchuri or creamy baby corn curry. Tender and just the right size, they make for a tasty snack, fresh or cooked. I chose to make a curry adding spinach and peas along with the babycorn. I don't find fresh baby corn here at all, so I resort to using the canned ones available in most Asian grocery stores. They taste just as good and save cooking time since they are pre-cooked and can be tossed in a curry in a snap. If using fresh baby corn, husk the corn, cut into bits and cook in boiling water until done. Drain and reserve. If using baby corn from a can, drain liquid and cut into bits. Heat one tablespoon of oil in a pan. Add the cashews and sauté until lightly brown. Add the chopped onions and green chillies. Cook until done, then add the ginger garlic paste, chopped tomatoes and turmeric. Cook until tomatoes are almost done. Cool slightly and then blend to a smooth puree using little water. Heat the remaining oil and butter in the same pan used to sauté the paste ingredients. Add the cleaned spinach and sauté for 2 minutes, till wilted. Then add cooked baby corn and peas. Cook for a minute and then stir in the prepared curry paste. Add the cumin and coriander powders, along with the crushed dried fenugreek. Season with salt, stir and simmer on low heat, covered, for 7 minutes. Stir occasionally. Check for seasoning and serve hot with rotis/parathas/naan. 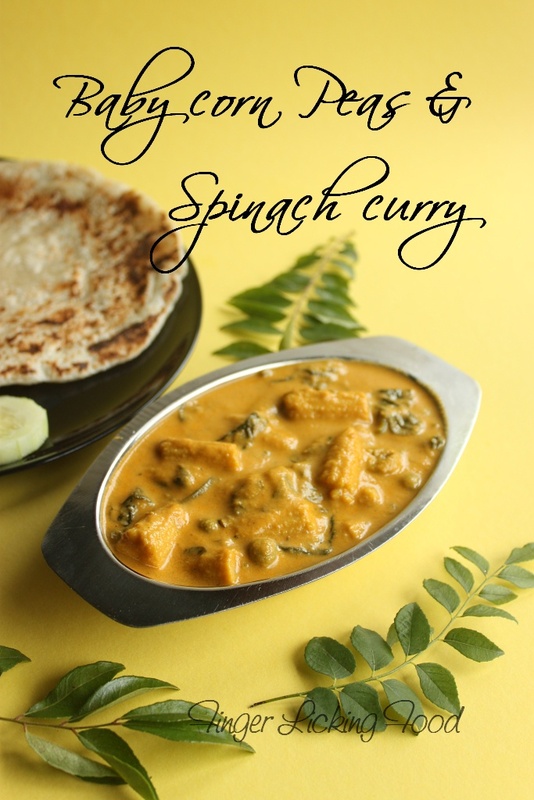 Sounds delicious combo,drool worthy healthy curry. Looks really creamy and tasty. 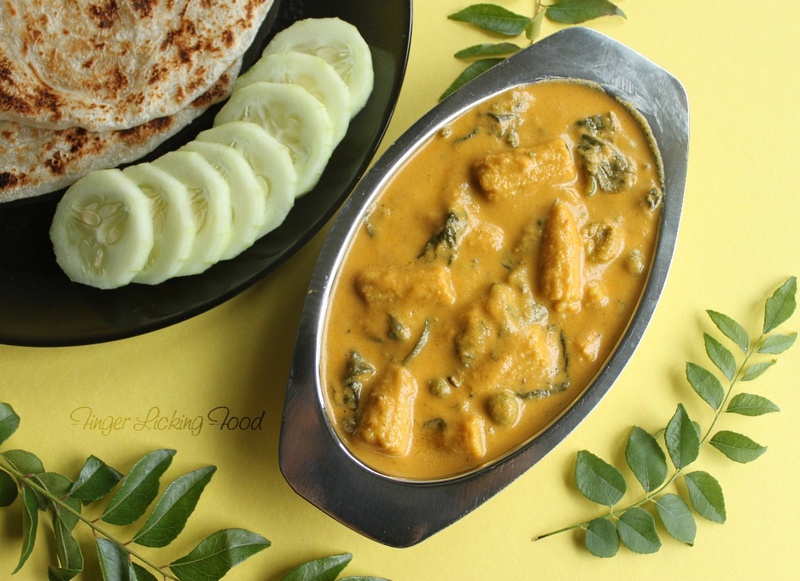 Would love to have with some roties, beautiful curry..
yummy and lovely delicious combo.